MaxLight X series stamps are incredible products. MaxLight X series stamps can carry a very large amount of ink and can last up to 50,000 impressions before needing to be re-inked. The MaxLight X Official Round Notary Stamp is the perfect tool for any notary but especially those with heavy workloads. The dual spring technology in the MaxLight X Official Round Notary Stamp allows for a perfect and neat impression every time - guaranteed. Our talented team will hand make your notary stamp to assure that all state board specifications are met. We take pride in our stamps, just as a notary takes pride in printing their seals on their documents. Unsure if the MaxLight X Official Round Notary Stamp is the best choice for you? Contact us! MaxLight X Official Round Notary stamps are not only a smart choice for your budget, but also for the environment. These stamps are created by an eco-friendly process and their built in inkwells will never require replacing. The MaxLight X Official Round Notary stamp is not only attractive but extremely functional. 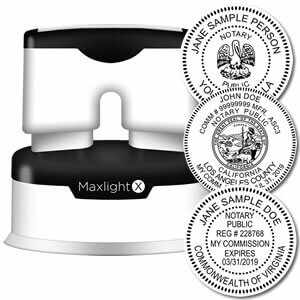 Once you try out one of our MaxLight X Official Round Notary stamps, you will never want to use any other type of stamp. The MaxLight X Official Round Notary stamp's dual spring technology guarantees a beautiful impression every time with minimal effort.